As reunions go, this one has historic overtones. 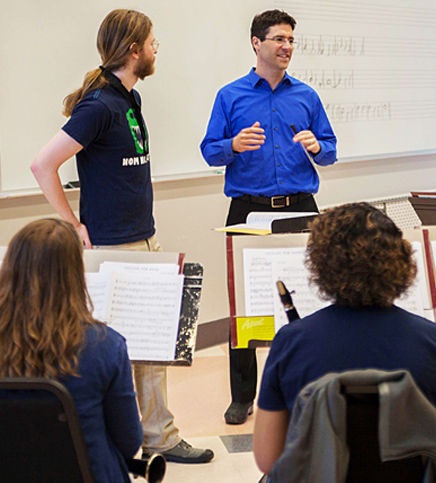 Two Lawrence University graduates, Matthew Arau, the chair of Lawrence’s music education program and the associate director of bands, and Yiannis Miralis, an associate professor of music at European University Cyprus, soon will renew their friendship at a three-day band conference May 6-8 in Nicosia, Cyprus. 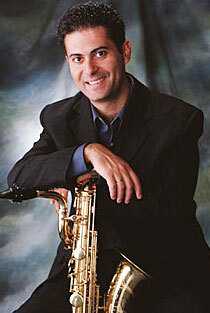 Matthew Arau ’97 is chair of Lawrence’s music education department. The conference, “Wind Bands in Greece and Cyrpus — Realities and Prospects,” will be the first of its kind for the entire eastern Mediterranean region and the Middle East. Miralis, a 1993 Lawrence graduate, is helping organize the conference, made his former saxophone studio colleague at Lawrence in the early 1990s an offer he couldn’t refuse: come to Cyprus to help launch this conference in style by delivering the conference’s keynote address and work with our attendees. The inaugural conference is expected to attract more than 50 band conductors, instrumental teachers and community leaders from Cyprus, Greece, eastern Mediterranean and Middle East countries. Arau will deliver the address “Leading from the Podium.” Beyond his keynote address, he will guest conduct the European University Cyprus symphonic band, play a saxophone concerto, give a talk on the history of the wind band, conduct an open rehearsal and participate in a round-table discussion on music education as part of the conference. Arau and Miralis first met in 1991 as the only two freshmen students in Professor Steve Jordheim’s freshman saxophone techniques class. Yiannis attended Lawrence on a Fulbright Scholarship from Cyprus and graduated with a bachelor’s of music degree in music education. Following the conference, Arau plans to stay with Miralis for a few extra days, catching up with his former classmate and working with some of Miralis’ university music students. “This event marks the most hats I have ever worn at a music conference – speaker, teacher, conductor and performer. I guess this is a true testament to my liberal arts education at Lawrence,” Arau said with a smile, looking forward to seeing his old friend and the beautiful Mediterranean Sea.